Here's the AP report of a widely publicized assault (the Jerusalem Post called it "a scathing attack") on Israel's moral standing made three days ago by the New York-based Human Rights Watch organization. Sarah Leah Whitson was HRW's key Middle East person when Bernstein wrote those words. He ended his 2009 words with a warning to HRW that unless it returned to "its founding mission and the spirit of humility that animated it", HRW's "credibility will be seriously undermined and its important role in the world significantly diminished". 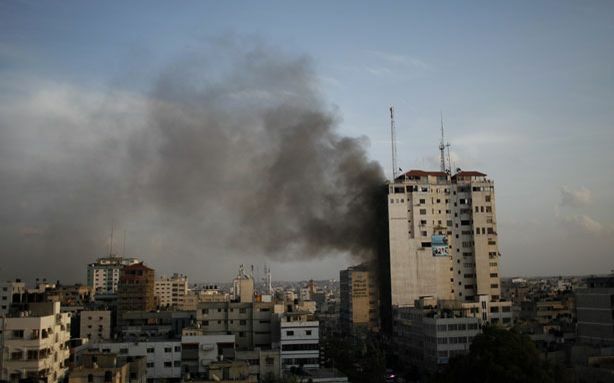 Just because Israel says a journalist was a fighter or a TV station was a command center does not make it so. Just because HRW claims something is a war crime does not make it so. We don't claim to have the depth of experience of Ms Whitson or HRW. But we do say our experience in losing a greatly-loved daughter to a bestial act of Islamist terror in 2001 has made us more sensitive than many people to nuances. We tend to pay attention to little-reported aspects of news events that somehow don't get that much coverage or attention by the likes of HRW. 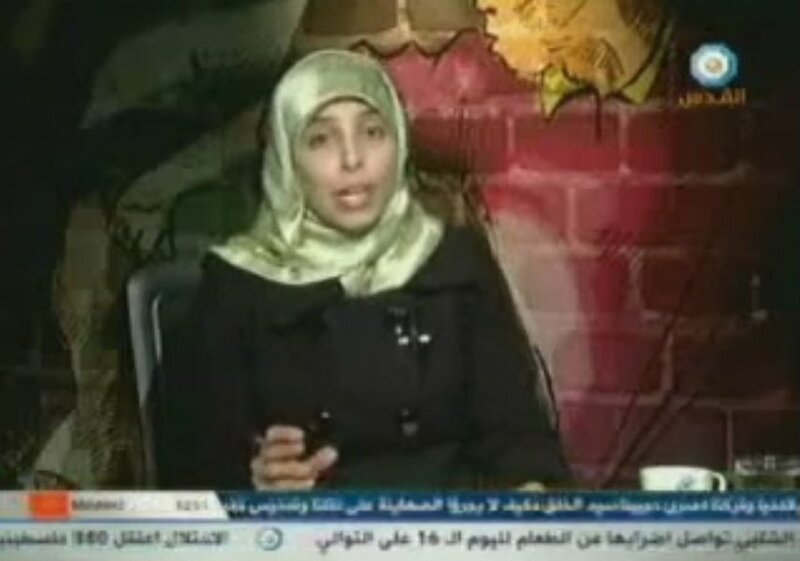 The image in Portrait 1 is a screenshot taken from a video recording of a PA Television evening news report originating in PA TV's Ramallah studios that went to air some years ago. The young woman, a reporter/presenter, was relatively new to the job at the time the picture was taken. Even so, she evidently showed journalistic promise because management in the Fatah/PLO television authority at the time assigned her to the role of presenting the evening news. Now some speculation: what if this woman had been (let's just imagine) intercepted by IDF soldiers or by an Israeli Border Guard patrol while she was peaceably en route to the nearby city of Jerusalem? We're betting that Sarah Leah Whitson and her HRW Irregulars would have screamed bloody murder at the temerity of the Israelis. The young woman is, after all, clearly a working journalist with all the privileges and protections that come with the job. 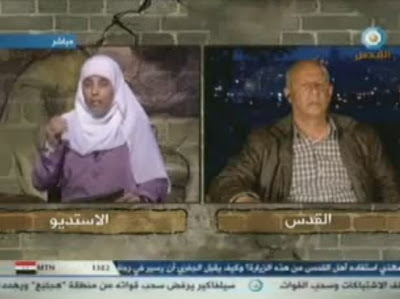 The woman in Portraits 2 and 3 above is a regular on the Al-Quds television channel owned and operated by Hamas. Its shows are beamed throughout the world to wherever there are Arabic-speaking audiences interested in the distinctive programming they offer. It has a truly global footprint and a large influence among a very specific international audience. 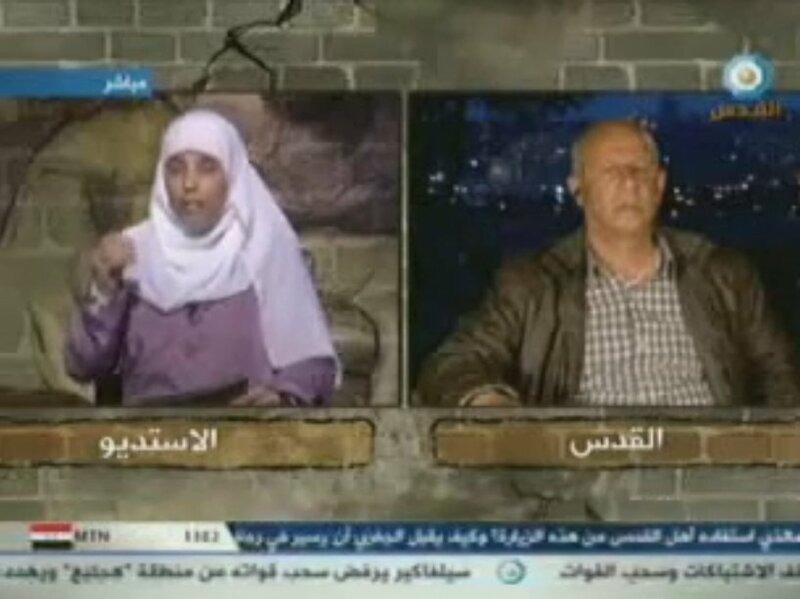 The woman is the central figure in a weekly television program devoted to surveying issues of interest to one of the deprived underclasses in Palestinian society. On it, she interviews guests, demonstrates cooking recipes, and summarizes and interprets recent events. The fact that an entire program aired during peak evening hours (and on Friday nights, no less) is given over to a woman suggests the prominent role she has in the tele-journalism field. Now some more speculation: imagine for a moment that this household-name TV personality decided to carry out some research in, say, East Jerusalem. And say that the Israeli authorities, for reasons best known to them, detained her on the way for questioning; that they refused to let her go because of some dusty old and forgotten breaches of the law allegedly committed a decade or so earlier. How long do we think it would take for the righteous indignation of Human Rights Watch to boil over and traverse the oceans? Or for their furious demands to be laid at the feet of the government of Israel insisting that the inherent rights of journalists and reporters - and international legal norms - be respected, forthwith? So now we're back in the real world. The name of the woman in all the photos above is Ahlam Tamimi. Tamimi read the PA TV evening news on Thursday evening, August 9, 2001. That is when Portrait 1 was taken. 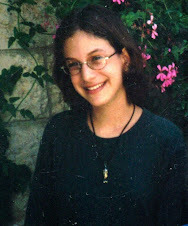 She started the program with the lead news item of the day: a horrific news report about a human bomb who had exploded inside a central Jerusalem restaurant that afternoon, killing many people, most of them children, all of them Jews. Portrait 1 shows her reading the actual report on camera. The slight smile of pleasure that can just be made out on her lips is probably no accident. She herself, personally, planned the bombing. She ensured with the other planners that the explosive material was adequate to the task. She accompanied the bomb (who was a newly-pious young man with a fully-loaded guitar case on his back) through the IDF military checkpoints and into Jerusalem by bus and taxi. She then walked with him through the streets of Israel's bustling capital city until they reached the Sbarro restaurant where, fifteen minutes after she left him there (giving her time to safely escape to freedom), he exploded the deadly materials packed into that guitar case. He killed our teenage daughter Malki and fourteen other innocents. A sixteenth victim remains unconscious to this day. Tamimi's journalistic career resumed a year ago. 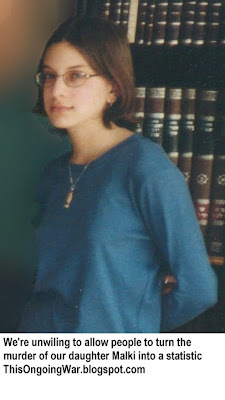 Then, as part of a deal transacted between Israel and the Hamas regime in Gaza, she was released from prison far earlier than should have been the case (she had been sentenced to sixteen life terms with a strong recommendation by the judges that no reduction should ever be considered) and flew to the land of her birth, Jordan, and to complete and unfettered freedom. There she was hired by Hamas to become the presenter of a new weekly program called Breezes of the Free, focusing on the convicted terrorists, many of them murderers of Jewish children, still in Israeli prisons and their goals, hopes and plans. For these and other reasons, we wonder - when we read the words of HRW, and especially of Sarah Leah Whitson - whether such critics comprehend the nature of terrorism. Do they see how the people who fire the rockets at homes, schools and buses will use everything at their disposal - every possible thing, no limits - to carry out their satanic plans? The notion that journalists ought to be treated in some privileged way by reason of the work they do - leaving them exempt from suspicion unless there is a compelling reason to think otherwise - is an interesting one. But we're left to wonder whether at HRW they know or care how this works in a war carried out by terrorists and in accordance with the principles of Islamism. Victims like our daughter suffered the permanent, irreparable violation by the terrorists of the most fundamental of their human rights - the right to live. Had the perpetrators (and that includes Tamimi) been stopped in time, or if they (and this includes Tamimi) were prevented from inciting others daily to do the same awful thing again in the future, lives would surely be saved. If HRW's recent condemnation fails to take that reality into account, then - in the words of their distinguished founder, Robert L. Bernstein - they have lost their critical perspective and the role they claim is simply illegitimate and should be ignored. Answering each and every lie published by the lying media is exhausting, and were we to try that as our answer to these lies, what we end up doing - in fact - is - giving more ammunition to the enemy. The Rebbe said that. He said that we provide the enemy with life-force by becoming concerned with these threats. If we take their threats so seriously that we become preoccupied with it, we take from our own vitality and thereby increase the vitality of the enemy. We must ignore it and raise ourselves. I sense the same thing every time I see these articles. We must concentrate on what make the Jewish people great and shine with it. A little light disperses a whole lot of darkness. If we all become secular reporters, instead of studious learners of Torah and Redemption, we feed the mouth that espouses hate towards us. On the other hand, I am torn with doubts because my family and most of yours, and of all Jews, are products of those who by the skin of their teeth escaped the greatest holocaust the world has ever known. I am not saying we should stick our head in the sand, but on the other hand I cannot dismiss the words of the Rebbe who, I feel, is telling us today a message we should heed, much as the prophets of yesteryear warned their own citizens back then.